Piyush Pandey, Executive Chairman and Creative Director Ogilvy South Asia won his first Cannes Lions awards with two Gold Lions for his work on an anti-smoking campaign in 2002, marking the start of a period of global recognition for a man who was already a creative legend in his native India. Piyush’s work is considered instrumental in the popularity of advertising campaigns produced in Hindi during the 1980s and 90s, heralding a shift to more universally accessible creativity in India. Prasoon Pandey, younger brother of Piyush is a highly respected director whose name has repeatedly featured in global rankings of top film directors. Prasoon is credited for directing the first Indian campaign to win a Lion, for Ericsson’s ‘One Black Coffee’ in 1996 and is one of the most awarded directors in India. Piyush Pandey joined Ogilvy & Mather in 1982, and made his name on work for Fevicol, Luna Moped, Cadbury and Asian Paints. In 1994 he was made National Creative Director for Ogilvy & Mather India. Piyush was the first Jury President from Asia at the 2004 Cannes Lions Festival. The Government of India awarded him the civilian honour of the Padma Shri in 2016. Prasoon Pandey started his career at Lintas Delhi, eventually becoming the creative director for Lowe India. He set up his own production company, Corcoise Films, in 2002. Piyush and Prasoon will be presented with the Lion of St. Mark at the closing awards ceremony of the 2018 Festival. The brothers will also take part in an interview hosted by Philip Thomas, CEO, Ascential Events in the Lumiere Theatre as part of the 2018 content programme. 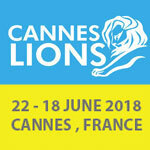 Cannes Lions is the annual meeting place for the global creative communications industry and takes place from 18-22 June 2017 in Cannes, France.